After getting a green signal from Prime Minister’sOffice, the Ministry of New and renewable Energy (MNRE) has sped up the process of establishing solar park projects across the country. The total capacity of the projects that will be spread across 20 states is 13,000 megawatt (MW). According to media reports, in a recent development, the ministry has started seeking weekly updates on these parks. As per the reports, Rajasthan would have three solar parks, two with a capacity of 1,000 MW each and one with 680 MW capacity. They would be executed by Surya Urja Company of Rajasthan Limited. Madhya Pradesh would develop two parks of 750 MW each. Tenders for one of these have been issued. Besides, Karnataka would also develop a 2,000 MW solar park and Punjab would have two parks of 500 MW each. The state-wise commissioning status of grid connected projects is in the order: Andhra Pradesh, Chattisgarh, Delhi, Gujarat, Haryana, Jharkhand, Karnataka, Madhya Pradesh, Maharashtra, Odisha, Punjab, Rajasthan, Tamil Nadu, Telangana, Tripura, Uttrakhand, Uttar Pradesh, West Bengal, Andaman& Nicobar and Chandigarh, as released by MNRE on June 4. The ten states which have communicated their interest for setting up solar parks orultra-mega solar power projects are: Rajasthan, Madhya Pradesh, Andhra Pradesh, Uttar Pradesh, Gujarat, Telangana, Karnataka, Meghalaya, Jammu and Kashmir, and Punjab, according to the Solar Energy Corporation of India (SECI), a public enterprise under MNRE. 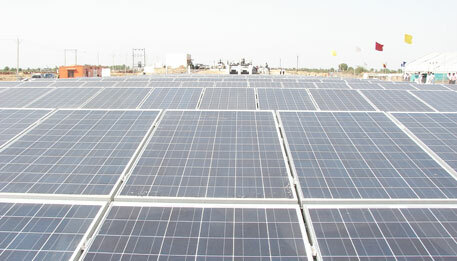 The objective of the scheme, as laid by the previous proposal, is to provide a huge impetus to solar energy generation by acting as a flagship demonstration facility to encourage project developers and investors,prompting additional projects of similar nature, triggering economies of scale for cost-reductions, technical improvements and achieving large scale reductions in GHG (greenhouse gases) emissions. The solar parks will be developed in collaboration with the state governments and their agencies. SECIwould be the agency for handling thescheme. According to SECI, a solar park is a concentrated zone of development of solar power generation projects and provides developers an area that is well characterised, with proper infrastructure and access to amenities. India lies in the high solar insolation region, endowed with huge solar energy potential and with most of the country having about 300 days of sunshine per year. This means that the solar power projects can be set up anywhere. SECI believes that individual projects of smaller capacity incur significant expenses in site development, drawing separate transmission lines to nearest substation, procuring water and in creation of other necessaryinfrastructure. Hundreds of millions of Indians do not have access to electricity, and blackouts are commonplace across the country. The appetite for energy is set to surge over the coming years amid an expansion of the economy and urbanisation. Demand for oil, for example, is expected to more than double to 8.2 million barrels per day by 2040, according to the US Energy Information Administration.